President-elect Kennedy and his wife greet well-wishers after attending a Sunday morning mass. Number 77 in a series of 77 John F. Kennedy cards. President Kennedy enjoys a chuckle as he speaks to his daughter, Caroline, during a long distance telephone call. Number 76 in a series of 77 John F. Kennedy cards. Senator John Kennedy and Mrs. Jacqueline Bouvier pose at Hyannis Port shortly after announcing the wedding plans. Number 75 in a series of 77 John F. Kennedy cards. Senator and Mrs. Kennedy ride in a motorcade in New York City during the campaign months of 1960. 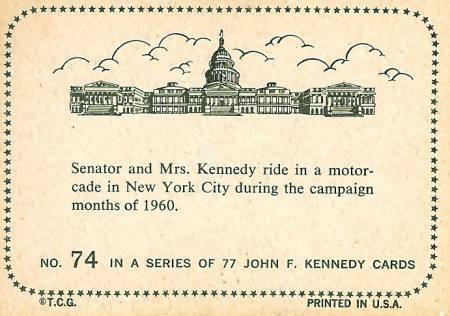 Number 74 in a series of 77 John F. Kennedy Cards. Senator and Mrs. Kennedy exchange fond glances after their marriage ceremony in Newport, Rhode Island. Number 73 in a series of 77 John F. Kennedy cards. Camelot began with the marriage of Senator John Kennedy and Jacqueline Bouvier. A few years later John became the 35th president of the United States. But on November 22nd, 1963, Lee Harvey Oswald while hiding in the Texas School Book Depository fired three shots at the Kennedy motorcade and the rest is conspiracy and conjecture that has lasted to today.